All the reddish spots on these flower bracts are due to anthracnose. 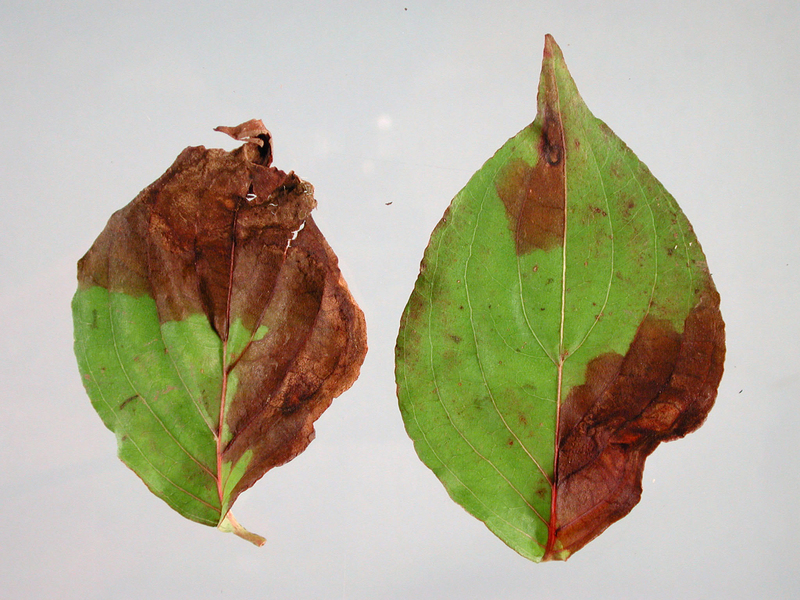 Many leaf lesions can disfigure leaves and stunt growth when disease pressure is high. Leaf blight due to anthracnose on this Cornus kousa. Notice the twig dieback from this fungal disease. Note the dead leaves. Photo by Everett Hansen, 1999. Cause Discula destructiva, (formerly Gloeosporium sp. ), a fungus that overwinters on dead twigs and on leaves on the tree and ground. Tiny brown fruiting bodies (acervuli) of the fungus are easy to see on dead twigs and leaves. Spores are dispersed by rain and wind then initiate new infections on succulent tissues in the spring. Conidial germ tubes penetrate leaves and tender stems directly. Shade and prior drought favor disease development. Pacific dogwood (Cornus nuttallii) is very susceptible. 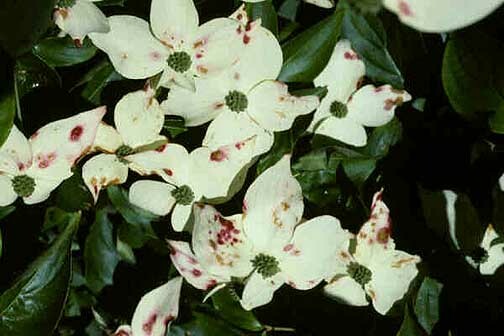 Flowering dogwood (C. florida) is moderately susceptible but is severely damaged under conditions ideal for disease development. Many but not all cultivars of Kousa dogwood (C. kousa) are very resistant (C. kousa var. chinensis has been quite susceptible in some studies). Bunchberry (C. canadensis), cornelian cherry dogwood (C. mas), and Japanese cornel dogwood (C. officinalis) are thought to be resistant. Symptoms Most common are large, brown, irregularly shaped blotches on leaves. Often, the diseased area is at or near the leaf tip, centered approximately on the midvein. The blotch often spreads down the midvein, giving a wedge-shaped appearance to the diseased area. Instead of blotches, leaves occasionally have brown spots with dark brown to purple margins. 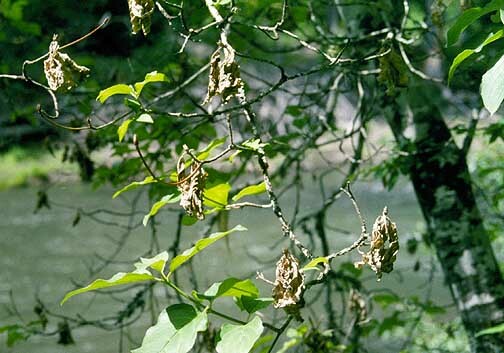 Infected leaves commonly drop before autumn, leaving the tree partially or totally leafless. 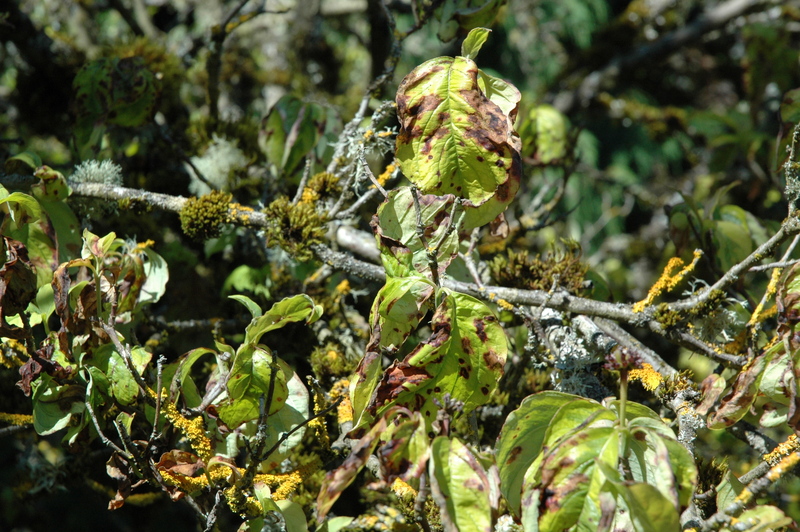 Affected twigs have sunken tan to brown spots with purple borders, which eventually enlarge and girdle the twig, resulting in twig dieback. Dead gray leaves often remain on the tips of these infected twigs all winter and spring. Prune out and destroy infected twigs when possible. Rake and destroy fallen leaves from spring through fall. Do not let irrigation wet the tree canopy. Plant resistant cultivars including the kousa cultivars Milky Way and Steeple and the hybrid cultivars Celestial, StarDust, and Stellar Pink. Chemical control Begin sprays at budbreak and continue at 10- to 14-day intervals until dry weather. Applications the rest of the growing season may be needed if periods of wet weather occur and there are infected leaves or twigs on the tree. Tank-mix and/or alternate products from different groups with different modes of action to prevent the build-up of resistant fungi. Limit the use of any one group during the growing season. Armada 50 WDG at 3 to 9 oz/100 gal water. Do not use a silicone-based surfactant. Not for nursery or greenhouse use. Group 3 + 11 fungicide. 12-hr reentry. Broadform at 4 to 8 fl oz/100 gal water. Group 7 + 11 fungicide. 12-hr reentry. Cleary's 3336 EG at 12 to 16 oz/100 gal water. Group 1 fungicide. 12-hr reentry. Compass O 50 WDG at 2 to 4 oz/100 gal water. Do not use organosilicate additives. Group 11 fungicide. 12-hr reentry. Concert at 9 to 17 fl oz/100 gal water. May cause injury to buds, blooms or tender new growth. Landscape use only. Group 3 + M5 fungicide. 12-hr reentry. Copper-Count-N at 1 quart/100 gal water. Oregon only. 48-hr reentry. Disarm O at 1 to 4 fl oz/100 gal water. Group 11 fungicide. 12-hr reentry. Eagle 20 EW at 6 to 12 fl oz/100 gal water. Group 3 fungicide. 24-hr reentry. Fame SC at 4 to 8 fl oz/100 gal water. Group 11 fungicide. 12-hr reentry. Heritage at 1 to 8 oz/100 gal water plus a non-silicone-based wetter sticker. Group 11 fungicide. 4-hr reentry. Mancozeb-based products. Group M3 fungicides. 24-hr reentry. Fore 80 WP at 1.5 lb/100 gal water plus a spreader-sticker. Protect DF at 1 to 2 lb/100 gal water plus 2 to 4 oz spreader-sticker. Myclobutanil 20 EW T&O at 6 to 12 fl oz/100 gal water plus spreading agent. May observe a PGR effect. Group 3 fungicide. 24-hr reentry. Nu-Cop 50 DF at 1 lb/100 gal water. 48-hr reentry. Propiconazole-based products. Group 3 fungicides. Banner MAXX at 2 to 4 fl oz/100 gal water. 12-hr reentry. ProCon-Z at 8 to 12 oz/100 gal water. 24-hr reentry. ProPensity 1.3 ME at 2 to 8 fl oz/100 gal water. 24-hr reentry. Tebuzol 3.6F at 4 to 10 fl oz/100 gal water. Group 3 fungicide. No reentry interval listed. Torque at 4 to 10 fl oz/100 gal water. Group 3 fungicide. 12-hr reentry. Tourney 50 WDG at 1 to 4 oz/100 gal water. Group 3 fungicide. 12-hr reentry. Zyban WSB at 24 oz/100 gal water. Not to be confused with the smoking cessation drug. Group 1 + M3 fungicide. 24-hr reentry. Note Some registered products offer only suppression of this disease and thus are not recommended for use. These products include Phospho-Jet. References Hibben, C.R. and Daughtrey, M.L. 1988. Dogwood anthracnose in northeastern United States. Plant Disease 72:199-203. Holzmueller, E., Jose, S., Jenkins, M., Camp, A., and Long, A. 2006. Dogwood anthracnose in eastern hardwood forests: what is known and what can be done? Journal of Forestry 104:21-26.